For now, I’m having fun with any income that comes my way but my focus is on building my tribe and email list. I know for a lot of you though, your blog is your side hustle and you want to one day say goodbye to that 9-5 job and say hello to blogging for good. 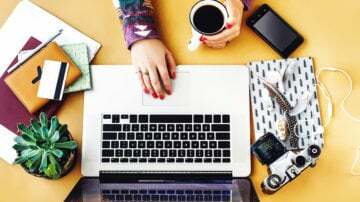 So, I’ve rounded up 10 smart ways to make money as a blogger. These are smart ways. These aren’t the quick ways to make money from home type of pins you might see on Pinterest. The ways I’m going to mention are proven and work. 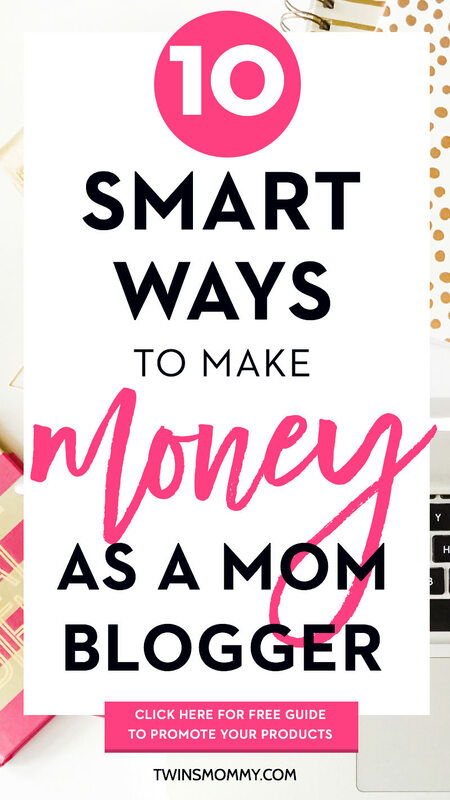 But before I get into the nitty gritty of this post, make sure you grab my guide on how to start your own mom blog so you can make money on your new blog!! The absolutely easiest way to get at least $100 is to guest post. Hands down! If you love blogging (which I’m sure you do if you’re a mom blogger) and you know a little sumthin’ sumthin’ about parenting, WordPress, marketing, decor, homsescholing, saving – just about anything – there is bound to be a blog to guest post for. And there are blogs that will pay you to write for them. 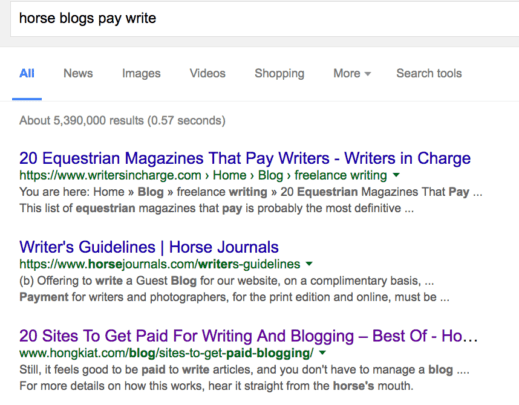 If you want to find blogs in a particular niche that pays for guest posts you can just Google it. So try it out and see what blogs you get. No matter what time of year it is, you can make money from blogging by creating a roundup post and use your affiliate links. What’s great about doing a roundup is that you can put a lot of affiliate links in your post. If you want to not come off as spammy you can mix your links with products that you don’t have an affiliate link for. Since I only have two or three affiliate links, I haven’t done a round up type post like that yet, but I know they are effective. For example, on my other blog, Smart Mom Ideas, I rounded up the funniest pregnancy tops. This is a bit bigger than some of the other ways to make an income online, but it can be profitable. A lot of bloggers eventually want to make a product and an easy avenue to doing this is creating an eBook. Now, what’s also great is that there is potential for future products based on your eBook. Bloggers are figuring out that they can first create an eBook, then a course and – for some – then a mastermind or coaching program. For example, Abby from Just a Girl and Her Blog has her Building a Framework book and she has a course called Book Boss for graduates of her Building a Framework readers. For a lot of bloggers, creating a course as a way to make money from home can seem like a big and hairy audacious goal, but it’s one of the best long-term strategies for making income from your blog. And you know what? You don’t have to blog for years or build your credibility before you create a course. I created a freelance writing course for bloggers and aspiring writers a year ago and I was barely a year into freelance writing. But, that didn’t stop me. I know I had a proven framework that others can go by and make their first $1k just like me. If you found success in one area, you can create a course out of it. For Twins Mommy, I know I’ve had success with traffic generation and great success with list building. People also know me for my Pinterest knowledge. From these topics I created a course to help other bloggers succeed. If a course is an overwhelming idea, why not do a quick masterclass? These can be an hour long or a couple of hours long. I created my masterclass in one afternoon and in the first six weeks of launching I made over $4k! There are only a couple of higher tiers to make money from home and one of them is to have a monthly subscription. This ensures passive income every month, but it does come with a lot of responsibility and creation. People who pay for your program expect the best information and resources available. Whether that’s webinars, podcasts, strategy masterminds, or a network of others that can keep your buyers accountable, your monthly program must help your buyers in their transformation. Gabrielle Brick – a virtual business partner and coach – has the Mother’s Mastermind which is $19.98/month (it’s currently closed) for moms who want more direction on being grounded while growing their business. If writing a big eBook or creating a huge course is overwhelming for you, another way to make money from your blog is to create multiple smaller products. These can be workbooks, smaller eBooks, or just other products you’ve created. 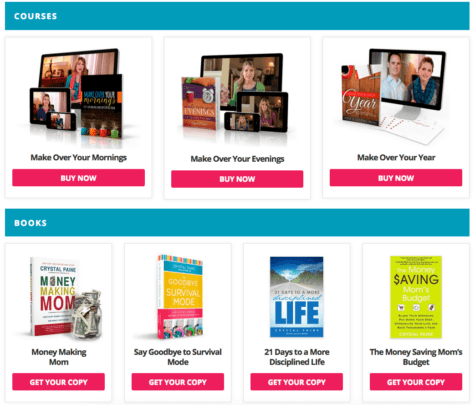 Crystal Paine of Money Saving Mom has several courses, eBooks and even clothing items for sale – and they are all under $50. Remember my #1 way to make money from home? If the blogger you’re going to guest post for allows it, place your affiliate links in your post. This is what I did for my guest post over at Living For Naptime and I made some affiliate income! And with every guest post I have I schedule it using Tailwind so that more and more people can take a look at it and maybe use my affiliate link! If you have a knack for styling, you can start selling your photos for bloggers! But, wait a minute! Aren’t there free places to get stock photos? Yes, but for a lot of bloggers, after a while, they may notice other bloggers using the same photos and want something different. That’s when they might start paying for stock photos and you can pounce on those people 🙂 I kid… For example, you start a mom blog and probably want some nice mom blog photos right? 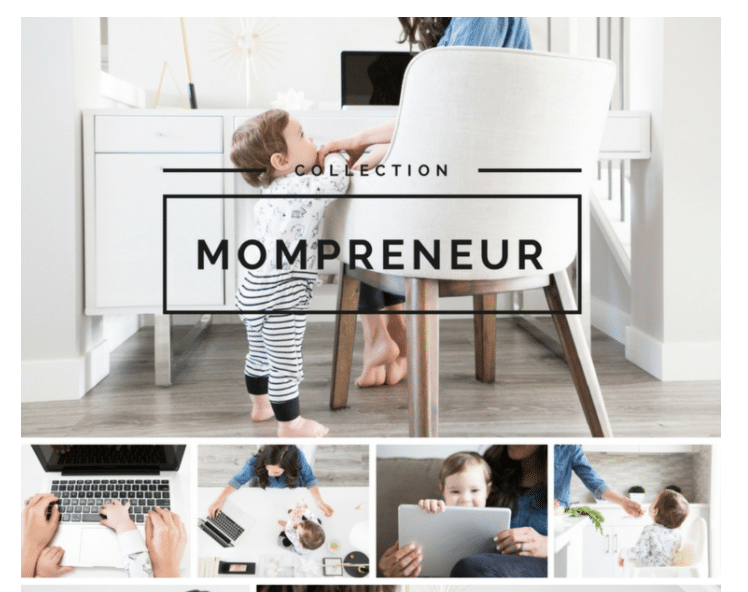 Haute Stock has you covered with their Mompreneur Collection! So mamas, get your camera out and have some fun! One of the best ways to make income from home fast is to offer a service. It shows your credibility and can help you grow your blog and brand. 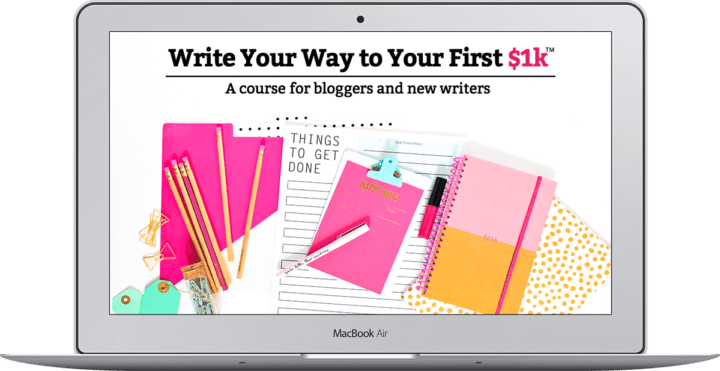 Mom blogger Cath is a student of my Write Your Way to Your First $1k course and she blew it out of the water mamas! 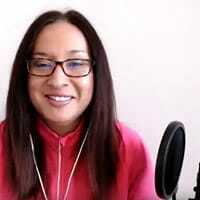 If you’ve struggled with surveys or other ways to make a few dollars online well… you might want to have a close look at Elna Cain’s Write to 1k course. Elna’s always said that the quickest way to make money blogging is to get other people to pay you to write blog posts for them. I agree! Have I told you that I made my first $1k online because of Elna’s course? And I used one of Elna’s cold pitch swipe files to win an $800 a month client? A final way to make money from home is to not only to sell your products on your blog, but also sell them on a marketplace. What do I mean? 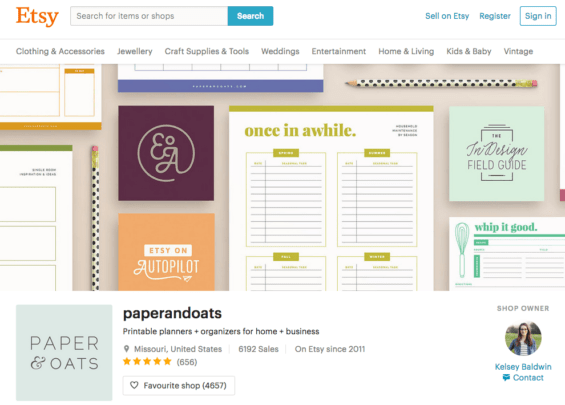 Well, Kelsey of Paper + Oats sells her printable planners on her blog and on Etsy. Two spots to sell the same products. This is a great way to grow your audience. Another place I’ve seen bloggers use is Creative Market for their photos. You ready to hit the jackpot mama? Tell me how you make money on your blog! That’s awesome! Yes, always be open to learning new things for sure! This will help your blog and business thrive! This has been a long time secret dream of mine. I think I will be coming to a crossroad this fall & a profitable blog would be amazing. How to narrow the content? ADHD mom of ADHD kiddos, professional nanny, mom of teens (and surprisingly loving it), navigating this tricky tech parenting world 80s style, crispy not crunchy oil mom…. You narrow your topics by what is already resonating with your audience. If you don’t know then keep writing in all those topics until you see some topics go viral on Pinterest or has the most comments or shares. From there you can narrow down topics! Awesome tips! Starting my own mom blog too and still planning on how to monetize my blog. In the meantime I guess the best is to just enjoy the process and keep writing quality content! That’s right! Enjoy blogging and the process! I want to start blogging, not just to make some money but because I just want to write. I’m a stay at home mom and I know nothing about how to get started. I read your blog about the topic, but I don’t know the “xyz” on how to start making money. I don’t want to get a blog under a company and then they own a portion of my earnings etc. HELP!! 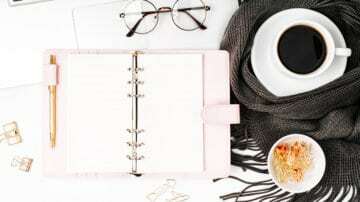 The best way is to start your own blog and from there decided if you want to have a blog or a service-based business (you can also do both). That can help you figure out the content on your site. This was a very comprehensive read Elna! Thanks for sharing. I’ve been asked a couple of times about how to earn money with a newer blog and it seems that most of these are well suited for beginners. That’s great to hear! Yes, many of these are for new bloggers in their first year for sure! If you have the time and motivation you can make it work! Good luck! THANK you for this post! Love your “laid back” perspective on your own blog…it certainly helps me to feel less pressure when it comes to my own! I see so many awesome blogs out there…and sometimes it gets me super flustered. I L.O.V.E. writing for my blog….but sometimes I totally forget it’s really about having fun and doing something that I love. Money…later-right? At the same time, I feel like the balancing act and having “laser focus” while home all day is very difficult (especially with littles at home all day!). I just posted something on my site about block scheduling…which I’m JUST starting. Seems to be working…we’ll see! I’m going to check out your link for blogs that will pay for guest posts…as I’m building this other love of mine, I still have to pay for the extras! OUCH. It’s all a HUGE balancing act for certain: maintaining blog, while trying to get traffic, while making money…I’m enjoying the journey but, like I said, sometimes forget that I SHOULD enjoy it. Thanks for the reminder!!! You’re welcome and thanks so much for your compliment to my writing style! I LOVE writing too and helping other mom bloggers 🙂 Maybe it’s a calling? Not sure 🙂 Either way, thanks so much. That’s awesome you’re finding a way to blog and take care of your little one! Making money as a mom blogger takes time and commitment and it is possible as a mom to a little one (or twins in my case!). Thanks for stopping by! Fantastic ideas for pulling in different kinds of income for your blog! I feel the creative juices flowing! Did you find it difficult to get your first guest posts spots when you started your blog? That’s awesome. So glad this post helped you get some creative juices flowing for income for your blog! Guest posting, in the beginning, was a challenge, but I got the hang of it and it got easier and easier. I say start with other mom blogs. It’s MUCH easier to land a guest spot there than on bigger blogs. I agree with you that ”These aren’t the quick ways to make money from home type of pins you might see on Pinterest.” I have always been facing problems with Ways to Make Money as a Mom Blogger and was trying to hire someone to help me. Thanks for all the good info! I love reading how others do so well at this! Thanks so much! I’m the same too! Great tips, Elna! I’ve been down a rabbit hole all evening reading your stuff. Really impressive! That made me laugh! Ha…glad you are enjoying my posts! Make sure to check out my FB page for some more juicy things and video….s for later! These are great ideas! Monetizeing my blog is definitely on my goals list for 2017! Glad you liked this post and I hope it will help you monetize your blog! Very helpful post Elna! I’m thinking on an ebook and a free email course to go along with it. My blog is for single moms. I’d love any ideas you may have. Great post! Thanks so much! Can’t wait to see your eBook or free email course! 🙂 Good luck. Love it! Gorgeous post – and so informative!! <3 Always love reading your stuff Elna. Thanks so much mama! Loving your blog too. I just did my 1st roundup. Great tips. You got me thinking about things in a different way. Thanks for sharing these with us. TGIF, have a great day and weekend! Thanks for stopping by and sharing my post too! I appreciate it. Yes, time is always something that we never have enough as a mom eh? Good luck and I can’t wait to see what you have in store! Hi Elna, great tips, as always! 🙂 I have a question about tip 7. What do you mean with putting your affiliate link in a guest post? Do you mean the actual link to the affiliate or the link to your blog post on your own website with the affiliate link in its content? I put the actual affiliate link in the guest post (not a link to a post with the affiliate link). Ask the blog owner you’re guest posting for if that’s OK and usually it is (for smaller type blogs). Hi Elna! I am thrilled you posted this! These suggestions are perfect for me. I can’t wait to start working on a few! I’m so happy to hear this. Please let me know when you use these tips 🙂 I’d love to promote your course or posts or anything you end up doing! These are great tips for making money, Elna! Right now, I am just doing affiliate links on my blog. However, 2017 brings lots of new things – namely my first course in February! That’s fantastic to hear! Can’t wait to see your new course. I’m still sitting on my ideas. I just don’t have the time to devote to product creation for TM. I’m doing a lot for Elna Cain right now so gotta focus on that! Hey Elna 🙂 Thanks for mentioning me! These are some great monetization methods you’ve listed – I’m going to try adding some new revenue streams for 2017. Offering services rocks! The only downside is that it’s very time-consuming! That’s awesome. Can’t wait to see what’s in store for This Mama Learns 🙂 Yes, offering a service can be time consuming but there are ways to increase your efficiency (like outsourcing and increase your typing speed).